Graduate student Robert Gibson spreads his love of music on a broad scale. Robert T. Gibson was only at Missouri State for two years, but his time as a graduate student was filled with real-world experience. Gibson, the associate conductor for Concert Chorale and Men’s Chorus, performed at the 2017 presidential inauguration and during an 18-day tour of South Africa. Gibson and the Chorale, a select group of about 50 student voices, were selected to perform as the principal musical group during Donald Trump's inauguration ceremony. 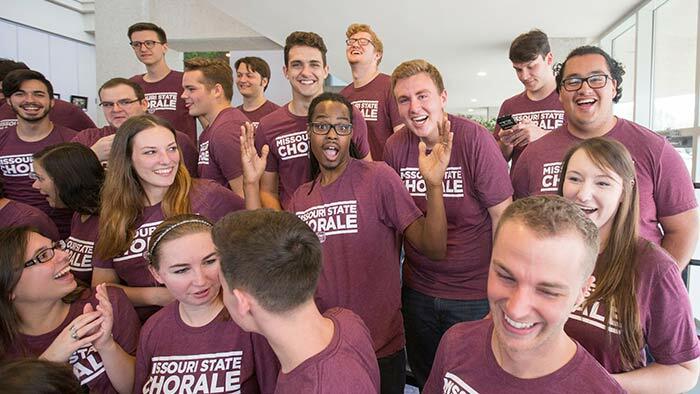 The trip to South Africa, with the MSU Men's Chorus, included visits to cultural monuments, performances with local choirs and a performance at the U.S. Embassy. “I still can’t put in words the (South Africa) experience that we had because it was so, so powerful,” Gibson said. Gibson has always been around music, whether as a conductor or singer. He first met Dr. Cameron LaBarr, Missouri State’s director of choral studies and a 2007 MSU graduate, when both were at the University of North Texas. When LaBarr accepted a position at his alma mater, he reached out to Gibson. Gibson, who earned his bachelor’s at North Texas, will graduate from MSU in May 2017 with a Master of Music in Choral Conducting. Gibson wants to teach, and after graduation he plans to move to Pennsylvania with his wife, an actress who has a job there. He wants his future students to love music as much as he does, and says it’s a universal language that helps people cross lines of background, race, religion, opinions and beliefs. Sheena knew she wanted to be a part of the hospitality industry from a young age. "Coming here was never about the degree."